There's no mention in the English-language story (from state-controlled China Daily) of Mexicans being placed in quarantine just because they're Mexican, as in today's WSJ story and previously here. 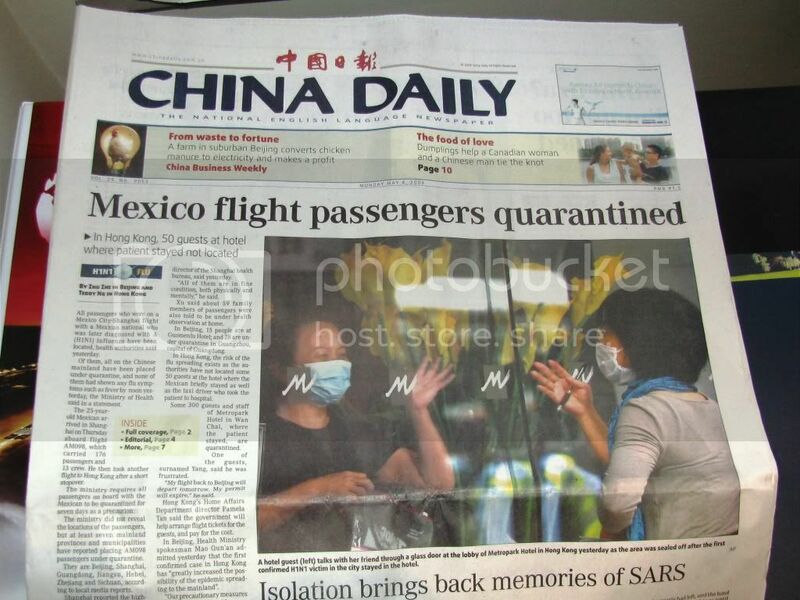 As best I make out the Chinese language People's Daily version, it has a lot more details about the quarantine but nothing (that I saw) on the Mexican-citizen front. The ChinaSMACK blog, which translates fascinating and sometimes hair-raising posts from Chinese language blogs, has a lot of Chinese people expressing support for a very tough line. The China Daily special coverage does include a quote from a Chinese citizen saying "no one is moaning about being quarantined, everyone knows it is necessary." It also says that the relief flight to take stranded Chinese citizens back home from Mexico, announced yesterday, has been cancelled because of trouble reaching "landing agreements" with Mexican airport authorities. I wonder why that could be.